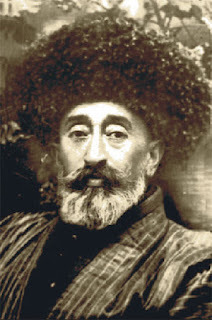 Khudaybergen Divanov was born in Khorezm in 1878, the son of the Secretary to the Khivan khan. Around this time, the khan had offered the German Mennonites to settle in the region, in a place that became known as Ak Metchet (white mosque). 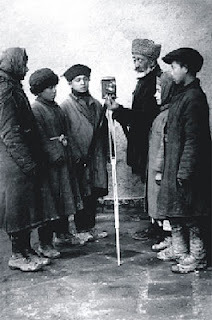 Wilhelm Penner, a Mennonite craftsman who had a German ZOT camera, (and who became known as Panorbuva - grandfather lantern), befriended the young Khudaybergen. Such was the young man's interest in photography that Penner eventually gave him the camera and the accessories. Young Divanov began photographing the remarkable streets, minarets and mosques of Khiva as well as his own family. There are many ethnographic shots such as dorboz (rope walkers), the walls of Khiva, hunters with hunting birds, typical Khivan donkey-carts, irrigators cleaning the ditches, etc). However, he soon came into conflict with the city's religious authorities. They complained to the khan that this activity was not approved by God and that angels would not enter a room adorned with human portraits. This khan was an educated man and a poet, writing under the pen name of Feruz. He asked Khudaybergen to photograph him. The khan liked the photo and recognized the creative and technical skills of the young artist. He not only protected him from the clergy, but invited Divanov to work at the Khivan mint. In 1907, the khan's delegation, led by Right Vizier Islam Khodja, went to Saint Petersburg. Divanov accompanied them to memorialize the event. He was permitted to stay in the Russian capital for two months in order to study photographic art. There he bought a Pathé cinematograph, a gramophone and new cameras. 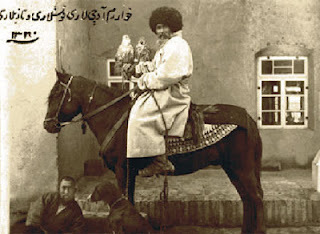 That equipment enabled him to independently produce the first Uzbek documentary featuring Asfandiyar, the Khan of Khiva, riding in a phaeton in 1910. His first films such as Architectural Monuments of Our Land (1913), The Sites of Turkestan (1916) and others have survived. He became an ardent promoter of photography and cinema: he demonstrated his own and foreign-made films in public places in Khiva and distributed pictures of Khorezm monuments with clarifying inscriptions in his own hand, often in Arabic. Divanov later became the Finance Minister of the People's Soviet Republic of Khorezm. Indeed, all bank notes issued in 1922 bear an imprint of his seal. He became the first Uzbek cameraman at the first Uzbek film studio. Divanov had been a member of Mladokhivintsy's dissident movement during the years of Stalin's repressions. He was arrested, denounced as an 'enemy of the nation' and executed in a Yangiyul prison camp in 1938. He was posthumously rehabilitated in 1958 after Stalin’s death. Anahita Photo Archive in Santa Fe has published and sells an interesting selection of Divanov's work as well as other Central Asian 19th century and pre-revolution images. During your stay in Khiva on an Uzbek Journeys tour, you will see several of Divanv's photos in various sites. And if you look carefully in the exhibit at the mint, you may even see bank notes issued during his tenure. You will see his photograph in the Museum of Victims of Repression in Tashkent on the last day of the tour.